Fall is a great time to plan ahead for your spring garden. Lilacs are among the most carefree of all shrubs. Their needs are simple: plenty of sunlight, good drainage, fertile soil, and annual pruning. Choose a planting site carefully and the only care needed is yearly pruning to maintain a nice shape. 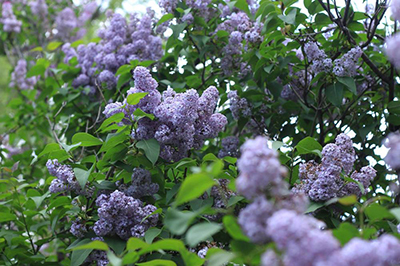 In the spring, a happy lilac rewards the gardener with clusters of fragrant blooms. Flower colors include blue, lavender, pink, red, purple, yellow, and white, depending on the variety. Most lilacsgrows 5 to 15 feet tall and wide, depending on variety. The fragrant flowers are good for cutting and attractive to butterflies. Lilacs can be planted in spring or in the fall before the ground freezes. In spring, lilacs are often shipped dormant in bare-root form. The plants are not dead, only “sleeping.” Upon arrival, remove any packaging from the root system and soak the roots in tepid water for 10 to 15 minutes. You can also purchase lilacs in pots. Lilacs grow best in full sun, so avoid planting them where they will be shaded for more than half a day. Be sure to plant them with enough space for future growth. Read the plant label to get the height and spread of the mature plant. To thrive, lilacs need good drainage. Soil should retain sufficient moisture to nourish the root system yet drain freely when rainfall is abundant. To test drainage before planting, dig a hole that is about 8 inches in diameter by 12 inches deep. Fill the hole with water. If the water has not drained after one hour, choose another site. The planting hole should be deep and wide enough to accommodate the plant’s root system. Place the top of the root ball level with the surface of the hole. If the lilac isbareroot, the top layer of roots should be a few inches below the surface. When filling in with soil, it is important to water thoroughly. The idea is to remove air pockets, yet keep the soil porous. 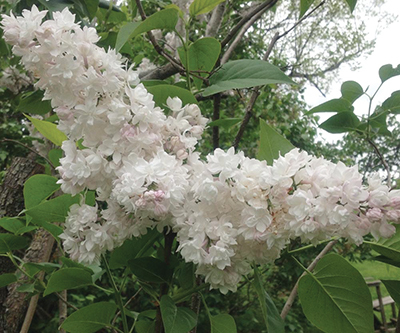 During the first couple years, it is important to water lilacs regularly. During dry weather, water more frequently. After the first growing season, granular organic fertilizer can be applied at the base of the plant early each spring to help provide the plant with nutrients for the coming year. Buds are set the previous year so the fertilizer will feed this year’s leaves and next year’s bloom. Lilacs love a “sweet” soil. If your soil is acidic, adding garden lime in the fall will help maintain an alkaline soil. If you have a repeat-blooming lilac variety, such as Josée, deadheading will stimulate the production of new flower and leaf buds. With other lilac varieties, deadheading is mostly cosmetic. It’s not required, but it does make the plant look better. 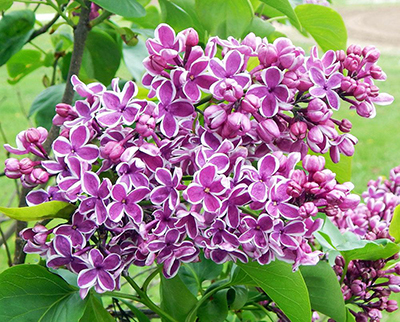 Lilacs do not require annual pruning, but cutting off spentflowerheads within a month after bloom will help the plant concentrate on preparing more flower buds and not seeds. If your lilacs become too tall, and the number of blooms declines, you can rejuvenate the plant by cutting one-third of the oldest branches. Cut these main stems to 12 to 15 inches from the soil. This will stimulate the growth of new shoots. Pruning in this way over a three-year period will refresh the plant without sacrificing blooms.